Many devotees around the world sing her glories and dance around her as part of their morning oblations. In India she is planted and worshiped outside peoples homes. Many devotees in colder climates go to great lengths and troubles to grow and care for her outside of her natural climate. There are several species and strains of Tulsi, two of the most prominent being Rama Tulsi (Ocimum tenuiflorum) and Krishna Tulasi (Ocimum sanctum). Tulsi, also known as Holy Basil, has many amazing health benefits and is widely used within Ayurveda, but for the purpose of this blog post it is her amazing personality that we shall focus on. Vrinda Devi (Tulasi) is the mother of devotion and the organizer of the eternal lillas taking place in Goloka Vrindavan. These are high topics indeed and ones that I’m not able to comment on but, needless to say, she is a very important person. We pray to Tulasi to grant us a place in Vrindavan and to increase our devotional feelings toward the divine couple Radha Krishna. Whenever we make delicious preparations of food and drink for Nimai or Lord Krishna we are sure to include a Tulasi leaf as part of the offering. We wear Tulasi beads around our necks to keep us always in touch with her and shelter from material woe. We chant the lords names on beads made from her wood with the knowledge that in doing so our bhakti is ever increasing! 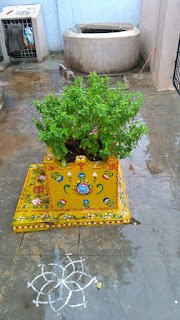 With some limited experience growing Tulasi plants over the years, I've realized that aside from the regular watering and daily care the well being and happiness of Vrindarani, is to a large extent depending on how much devotion and the chanting of Krishna’s name one is approaching her with. In other words; she is responding to bhakti. If I am not feeling so devotional or spiritually inclined, there is a relative drooping and dropping of her leaves. If my bhajana is empowered and flowing then she is responding with plush and vibrant growth. Unfortunately, growing her in the northern hemisphere means she tends to be short lived, but being the embodiment of a pure devotee she is giving freely the remnants of her wood and leaves to help us in our devotional practice. This song is practically describing everything the aspiring devotee needs to know to glorify Vrindadevi, the reasons why we worship her, and the importance of developing attachment to her. Very beneficial for someone trying to cultivate spiritual life. Fortunately, Tulasi worship came very naturally to me. I was already in awe of the many wonderful trees and different personalities they exhibit. 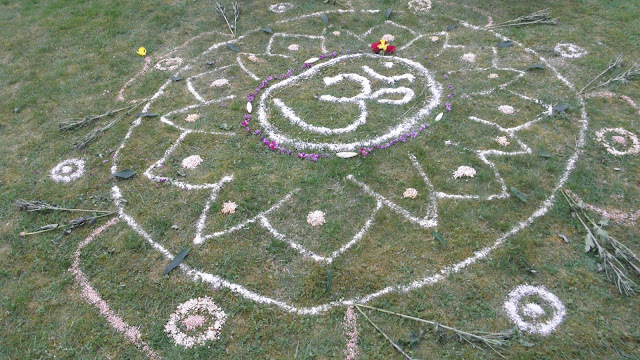 In seeing the love and high regard the devotees held this special plant it confirmed to me that I was home and these were the people I want to share my life with. As my relationship to Tulasi grows, changes, and develops, I hope those relationships to her devotees deepen, grow, and develop as well.